My guest today, Gill Downs, is not a writer, although, having been on the receiving end of many wonderful emails from her, I know she could be. 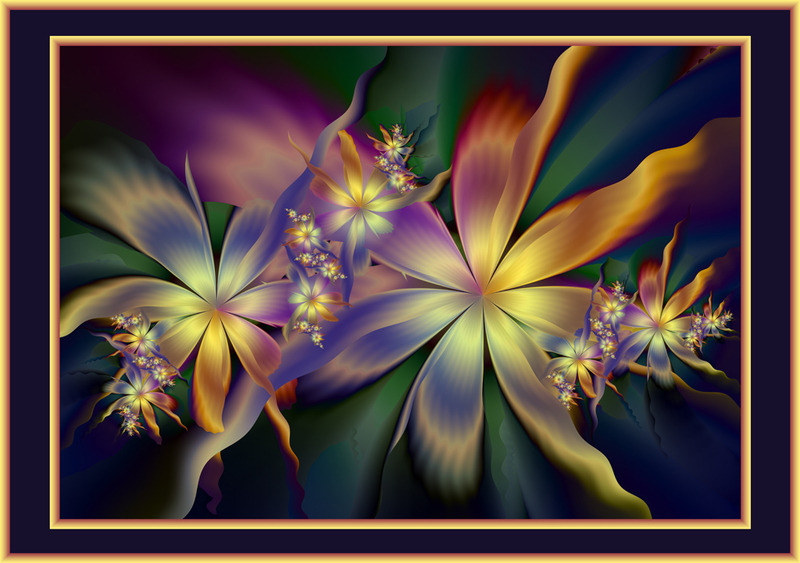 She has appeared before in this blog, but this time she’s here to tell us about the business she has developed around the fascinating world of fractal images. Not having much idea of these, I began with the obvious question. G: Fractals are forms produced by fractal geometry and characteristically contain infinite copies of themselves at different points and scales, revealing more and more detail however closely you look at them. Fractal geometry underlies the forms of the natural world, and the beauty of the patterns and structures seen in fractals are evocative of those found in nature – in, for example the self-similar patterns and forms of leaves and flowers, snowflakes, mountains, clouds and river networks. M: What made you decide to create fractal images? G: I came to making fractal images from a long-standing interest in fractals. I remember watching a fascinating TV programme about the Mandelbrot Set [M: see http://inpotential.com/wordpress/articles/numerology/arthur-clarke-fractals-colors-infinity/ for another fascinating programme] years ago when computers powerful enough to generate them were first available, so when I eventually had a half decent computer myself I began investigating fractal generating software. I had no idea before this that sophisticated fractal graphics programs had been developed and that there existed a whole world of fractal art and artists creating beautiful fractal images. M: What have you learnt from this venture? Has it changed your aspect on life in any way? G: I’ve learned a great deal of technical stuff, and I’ve acquired a lot of new skills which have wider applications. And it has changed my aspect on life through a deeper understanding of the role fractal geometry plays in shaping the universe. It’s also led me to becoming involved in communities, both real and virtual, based around fractals and/or art and artists. M: Do you have to know a lot of maths to create the images or does the software do it all for you? G: Well that’s not really an either/or question. No, you don’t have to understand the underlying maths to use the software, but even so it certainly doesn’t do it all for you. There are fortunately some very brainy formula writers who write the fractal formulas and colouring algorithms for the principal software I use, Ultra Fractal, but the parameters of the formulae can be changed and combined by the user in numerous ways to create an infinite variety of possible images, the characteristics of which are user-defined. Gill, thank you so much for giving us a brief introduction to this complex topic. Gill’s company is called ex entropy. If you want to know where the name comes from or any other information about fractal images and the cards and prints that ex entropy produces, you’ll probably find the answer at http://www.exentropy.co.uk/. Gill has very kindly offered to give away three of her images to the winner of my competition. These will be of their own choosing, selected from any on the website, and will be sent rolled in a tube to wherever the winner is in the world. So, here’s what you have to do. Write a story about a character who suffers from social anxiety or just describe such a character. If you’ve read some of my blog, you might have an idea about how such a character would behave. Or you might know someone who fits the bill. Or you can find explanations on the Internet. The winner will be the person whose description or story best captures the essence of the disorder, in my opinion. Rules: maximum 200 words, to be sent to miriamcompetition@yahoo.co.uk or as a comment to this post by Monday, April 5. While you’re busy writing, I’ll be busy too – sping cleaning. Grrrrr! The girl followed the donkey to a small, deep pool in the woods, and there she took off her backpack and chucked it in. Then the two of them went back to the dance and waltzed all night, unencumbered. Aww, how sweet. Thanks Annette! Happy Birthday! A day late, but much happiness wished for you all the same. Funny, but I’ve been struggling with a short story about a guy with an anxiety disorder. I’m having trouble with the ending! If I can get it together, I’ll it to you. Maybe even by the deadline. Fractals are beautiful images. I don’t know anything about making them, but I used to spend hours working on designs that were kind of similar. More kaliedoscope-like and by hand, but still. Thanks for the interview too. Thanks mapelba! Looking forward to reading your story.